The Brunello of Montalcino 2012 by Biondi Santi represents an icon of oenological tradition and stylistic perfection. Coming from the vineyards of the historic family estate from the age of 15 to 30 years. Mature for 36 months strictly in Slavonian large oak barrels. A red wine of immense finesse and balance, and incredible longevity: from 20 to 40 years. Great. 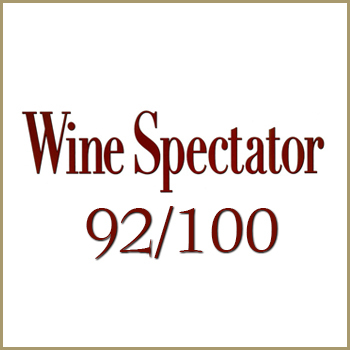 THE WINE The Brunello of Montalcino 2012 by Biondi Santi represents an icon of oenological tradition and stylistic perfection. Coming from the vineyards of the historic family estate from the age of 15 to 30 years. Mature for 36 months strictly in Slavonian large oak barrels. A red wine of immense finesse and balance, and incredible longevity: from 20 to 40 years. Great. THE HISTORY The story of Brunello del Greppo begins with Clemente Santi, nephew of Giorgio Santi , of whom Prof. Baccio Baccetti, in the publication â€œCultura e Università a Siena (Culture and University in Siena) - July 1993 in the chapter on Naturalists from Siena writes, among other things: Giorgio Santi (Pienza, 1746 - Pienza, 1822) dedicated much of his life to naturalistic exploration. Almost immediately after graduating with a degree in Medicine from Siena University he travelled to France, first to Montpellier and then to Paris, where he made the acquaintance of great scientists such as Lavoisier and Buffon. He returned to Tuscany to ask the Grand Duke Pietro Leopoldo license to enter into the service of the Sovereign of Baden, but the Grand Duke, who was very good at recognising people qualities, answered by assigning him the post of professor of chemistry and natural history at Pisa University and of Director of the Museum and Botanical Garden. From then on, all his efforts went into teaching, reorganising the Pisa Museum and exploring the land of Tuscany. Under French rule, he was appointed Inspector General of Studies and then under Ferdinando III, Honorary Head of Education of the Tuscan Universities. In the three volumes that describe his travels around the Province of Siena, he concentrated mainly on the botanical and geological aspects of the areas visited. The work was extremely successful, so much so that it was translated into the main European languages. He was among the initiators of the reports on explorations drawn up using the odeporic method, adopted between the 18th and 19th centuries by numerous travelling naturalists. The nephew, Clemente , son of Luigi Santi and Petronilla Canali, a pharmaceutical graduate of Pisa University and renowned writer, owned vast estates in Montalcino and Pienza, and dedicated much of his activity to agriculture, particularly to a farm called Greppo, owned by his mother, Petronilla Canali. His knowledge of chemistry and science helped him to elevate his oenological techniques to enviable levels towards the end of his life. Before gaining recognition for his select red wine (brunello) of 1865, his Moscatello had also been awarded a prize at the Universal Expo in Paris in 1867 (an oenologically outstanding acknowledgement given that the French at that time considered themselves to be the only producers of high quality wine worldwide). He made red wines suitable for ageing and had identified racking and barrel-ageing techniques which were more advanced than those used by his peers. Clemente Santi's daughter, Caterina, married Jacopo Biondi, a doctor from Florence. The aristocratic Biondi family originated from the town of Pomarance. Their son, Ferruccio, inherited his maternal grandfather passion for wines and vines (he united the surnames in rightful tribute to the Santi family). Ferruccio Biondi Santi set extremely severe production standards. Other early 19th-century producers obtained important diplomas for their so-called Brunello wines: Paccagnini, Anghirelli, Angelini, Vieri Padelletti, but no one succeeded in continuing the production of their wines beyond the end of the First World War. On the strength of the extraordinary experience of his maternal grandfather, Clemente Santi, Ferruccio skilfully ran the Greppo estate and, as often happens in the most fortunate historical decisions, his success was due partly to adversity: in the middle of the 19th century, oidium (powdery mildew), followed by phyloxera and then downy mildew, struck Europe and consequently Greppo. The phyloxera posed an unprecedented threat to the survival of his vineyards. But while the winegrowers tried to create red wines which were suitable for drinking immediately (see also the governance of new wine) and therefore capable of generating quick profits from the new vineyards, he looked towards new horizons, making the singular decision to make a wine which he believed would be suitable for long ageing, vinifying 100% Sangiovese. In 1932, he was described as the inventor of Brunello by an Interministerial Commission, which studied the Chianti district, including Montalcino. Towards the end of the 19th century, he began the methodical mass selection of Sangiovese on his Greppo estate. In the end, he completely replanted all of his vineyards, grafting them on wild vine cuttings, with buds taken from mother plants identified at Greppo: in a certain sense, he pre-empted the Tuscan trend for producing full-bodied red wines, vinifying 100% Sangiovese, by about a century. He died in 1917. Ferruccio's son, Tancredi , was born in 1893. He learned the secrets of the vineyards and cellars of the Greppo Estate from his father even before he went to study oenology in Conegliano Veneto (location of a prestigious viticulture and oenology school â€“ where he studied as a pupil of Professor Giovanni Dalmasso), going on to graduate with a degree in Agronomy from Pisa University. After the death of his father Ferruccio, in 1917, he continued running Greppo alone, while his brother Gontrano bought a farm in Siena. As of the 1920s, he raised Brunello to new levels of class and prestige and became the ambassador for Montalcino and its wines (a photo taken in 1932 shows him watching over the load of two trucks carrying cases full of bottles of Brunello and Chianti, bound for the Port of Livorno and then America). Tancredi Biondi Santi realised that is was necessary to top up the old Reserves, the level of which was falling. He uncorked them, checked to make sure that the wine was still perfect, topped them up with wine from the same vintage and then re-corked them (first doing so in 1927 for the 1888 and 1891 Reserves). 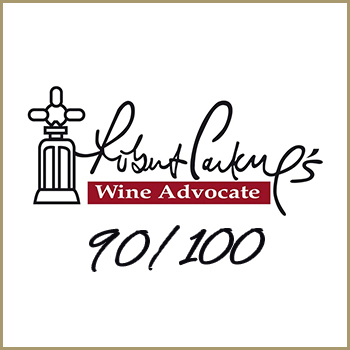 Other winemaking estates all over the Italian Peninsula requested his advice: from the Lugana wine in Desenzano sul Garda, to Chianti in the Siena district, from Fiorano del Principe Boncompagni in Roma to Cirò in Calabria. His final act, in March 1970, was the topping up of his old bottles of Brunello Reserve 1888 1891 1925 - 1945, in the Greppo Wine Cellar, in the presence of Mario Soldati, Luigi Veronelli and Paolo Maccherini: we can definitely say that that act, perhaps better then any other, represents his career as an expert oenologist, and still confirms the supremacy, diversity and typicality of Brunello del Greppo today. 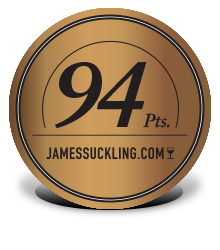 Brunello di Montalcino Biondi Santi touches the peak of its fame and splendour, enjoying the very highest esteem of the worldâ€™s most attentive and refined connoisseurs. 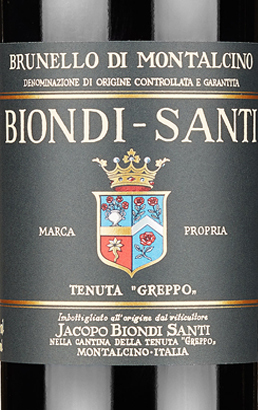 Having taken over at the helm of the estate after graduating with a degree in Agrarian Science from Perugia University, Franco Biondi Santi , oenologist, learned the subtle art of vinification from his father, and has continued to run the Greppo Estate, with its unequalled collection of Reserve bottles. This does not, however, mean that he has rested on the laurels of his forefathers. In the meantime, the discipline of the D.O.C. (denomination of controlled origin) had encouraged other winegrowers to plant vines and improve techniques in the hope of exploiting the excellent image of Brunello. In this scenario, which has witnessed an exponential growth in the number of hectares registered for the cultivation of Brunello (from 76 hectares in 1967 to the current 2100 in 2009), Franco Biondi Santi has increased the production of Brunello del Greppo from the 4 hectares cultivated until his father death, to the current 25. He has continued to pursue strict, traditional agronomy and cellaring practices to consolidate the typical character and improve the quality of Brunello del Greppo, convinced that he can equal (given the same use of the land and vineyards) his great 100 year-old Brunello Reserves. Thanks to the constant personal international promotion of his wines, since 1970 Franco Biondi Santi has succeeded in creating the understanding and appreciation of the remarkable typical character and quality of his Brunello del Greppo. The future continuity of Greppo is represented by Franco two children, Jacopo and Alessandra, who are both working at Greppo already: Jacopo, with his vivid imagination in relation to wines (firmly convinced of the typical character of Brunello del Greppo), Alessandra involved in promoting the estate. Tasting Color: bright ruby red. Bouquet: large and complex notes of pink canine, violet, currant, undergrowth. 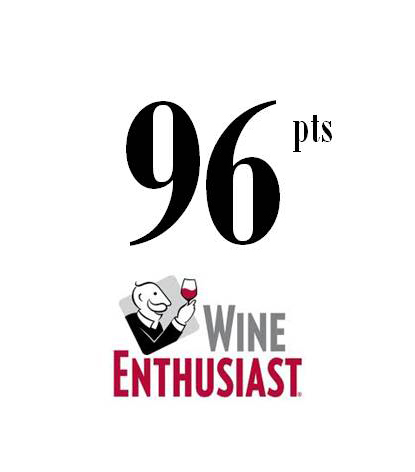 Taste: fresh, balanced, with a thick and velvety tannic texture, unique finish for persistence. Giorgio Santi (Pienza, 1746 - Pienza, 1822) dedicated much of his life to naturalistic exploration. Almost immediately after graduating with a degree in Medicine from Siena University he travelled to France, first to Montpellier and then to Paris, where he made the acquaintance of great scientists such as Lavoisier and Buffon. He returned to Tuscany to ask the Grand Duke Pietro Leopoldo license to enter into the service of the Sovereign of Baden, but the Grand Duke, who was very good at recognising people qualities, answered by assigning him the post of professor of chemistry and natural history at Pisa University and of Director of the Museum and Botanical Garden. From then on, all his efforts went into teaching, reorganising the Pisa Museum and exploring the land of Tuscany. Under French rule, he was appointed Inspector General of Studies and then under Ferdinando III, Honorary Head of Education of the Tuscan Universities. In the three volumes that describe his travels around the Province of Siena, he concentrated mainly on the botanical and geological aspects of the areas visited. The work was extremely successful, so much so that it was translated into the main European languages. He was among the initiators of the reports on explorations drawn up using the odeporic method, adopted between the 18th and 19th centuries by numerous travelling naturalists. Clemente Santi's daughter, Caterina, married Jacopo Biondi, a doctor from Florence. The aristocratic Biondi family originated from the town of Pomarance. Their son, Ferruccio, inherited his maternal grandfather passion for wines and vines (he united the surnames in rightful tribute to the Santi family). Ferruccio Biondi Santi set extremely severe production standards. Other early 19th-century producers obtained important diplomas for their so-called Brunello wines: Paccagnini, Anghirelli, Angelini, Vieri Padelletti, but no one succeeded in continuing the production of their wines beyond the end of the First World War. On the strength of the extraordinary experience of his maternal grandfather, Clemente Santi, Ferruccio skilfully ran the Greppo estate and, as often happens in the most fortunate historical decisions, his success was due partly to adversity: in the middle of the 19th century, oidium (powdery mildew), followed by phyloxera and then downy mildew, struck Europe and consequently Greppo. But while the winegrowers tried to create red wines which were suitable for drinking immediately (see also the governance of new wine) and therefore capable of generating quick profits from the new vineyards, he looked towards new horizons, making the singular decision to make a wine which he believed would be suitable for long ageing, vinifying 100% Sangiovese. In 1932, he was described as the inventor of Brunello by an Interministerial Commission, which studied the Chianti district, including Montalcino. 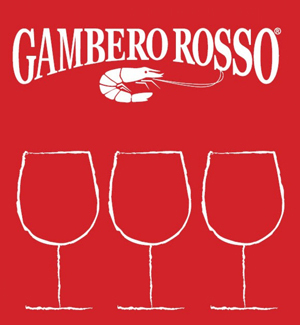 Towards the end of the 19th century, he began the methodical mass selection of Sangiovese on his Greppo estate. Ferruccio's son, Tancredi, was born in 1893. He learned the secrets of the vineyards and cellars of the Greppo Estate from his father even before he went to study oenology in Conegliano Veneto (location of a prestigious viticulture and oenology school â€“ where he studied as a pupil of Professor Giovanni Dalmasso), going on to graduate with a degree in Agronomy from Pisa University. After the death of his father Ferruccio, in 1917, he continued running Greppo alone, while his brother Gontrano bought a farm in Siena. As of the 1920s, he raised Brunello to new levels of class and prestige and became the ambassador for Montalcino and its wines (a photo taken in 1932 shows him watching over the load of two trucks carrying cases full of bottles of Brunello and Chianti, bound for the Port of Livorno and then America). 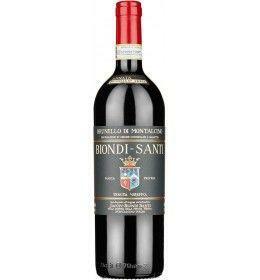 Tancredi Biondi Santi realised that is was necessary to top up the old Reserves, the level of which was falling. He uncorked them, checked to make sure that the wine was still perfect, topped them up with wine from the same vintage and then re-corked them (first doing so in 1927 for the 1888 and 1891 Reserves). 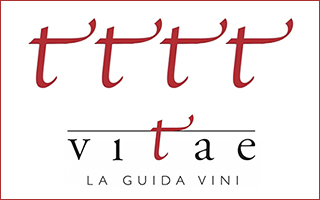 Other winemaking estates all over the Italian Peninsula requested his advice: from the Lugana wine in Desenzano sul Garda, to Chianti in the Siena district, from Fiorano del Principe Boncompagni in Roma to Cirò in Calabria. His final act, in March 1970, was the topping up of his old bottles of Brunello Reserve 1888 1891 1925 - 1945, in the Greppo Wine Cellar, in the presence of Mario Soldati, Luigi Veronelli and Paolo Maccherini: we can definitely say that that act, perhaps better then any other, represents his career as an expert oenologist, and still confirms the supremacy, diversity and typicality of Brunello del Greppo today. In this scenario, which has witnessed an exponential growth in the number of hectares registered for the cultivation of Brunello (from 76 hectares in 1967 to the current 2100 in 2009), Franco Biondi Santi has increased the production of Brunello del Greppo from the 4 hectares cultivated until his father death, to the current 25. He has continued to pursue strict, traditional agronomy and cellaring practices to consolidate the typical character and improve the quality of Brunello del Greppo, convinced that he can equal (given the same use of the land and vineyards) his great 100 year-old Brunello Reserves. Thanks to the constant personal international promotion of his wines, since 1970 Franco Biondi Santi has succeeded in creating the understanding and appreciation of the remarkable typical character and quality of his Brunello del Greppo. The future continuity of Greppo is represented by Franco two children, Jacopo and Alessandra, who are both working at Greppo already: Jacopo, with his vivid imagination in relation to wines (firmly convinced of the typical character of Brunello del Greppo), Alessandra involved in promoting the estate.